I’ve thought a lot about this. What DO quilters want? When I originally planned this post, I was going to roll out the new page on my website, My Favorite Things, where I list books and tools that I recommend in class. Those of you in my art quilt classes have seen many of these things but I thought it might be time to share them with a broader audience. The page is there whenever you wish to peruse it, but the answer to my original question is deeper than material things (pardon the awful pun). And so, what do quilters want? Lots of fabric and the time to play with it? The new Bernina 830? 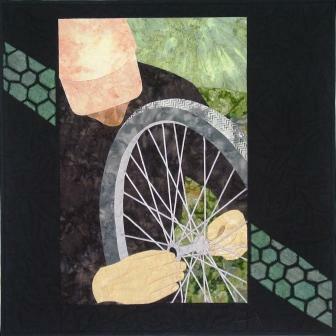 A permanent studio at your favorite quilt shop? I think we want more. We want soulful things, selfless things. We want all that is good in the world. I’m trying very hard not to say “world peace,” but I think we do want that. We want peace for the world and for ourselves and our loved ones. And so, my quilting friends, this is what I wish for you during this busy season. Quiet minds so that you can create without the noise and distractions. I wish you the ability to shut out all of the negativity and doubt and worry so that you can recharge your batteries. Unlimited skills and abilities. Or…access to classes and books and friends who are happy to share their skills and abilities with you. Imagination and inspiration and ideas. May your well never run dry. Life in balance. I hope that you can find that personal balance that works for you, that allows you to keep moving, keep creating, keep on doing the things that make your heart sing. Time to create and tools with which to do the work. May your toolbox never be empty. Simple pleasures. Whatever that means for you – fabric, chocolate, a nice fume blanc – I wish that for you. It’s Done! Vintage Revisited #6 is Done! The final quilt is done! I think the spokes made all the difference. After a lot of thinking about how to represent the spokes, I took a trip to G Street Fabrics and bought skinny grey ribbon. I zigzagged it into place and that was that. Did this quilt present challenges? Oh, you bet! Quilting density was a tiny little demon sitting on my shoulder. First it would whisper, “Leave the shirt unquilted. Quilt in wrinkles or folds and leave the rest.” Then, the shirt looked too puffy and the demon would laugh at me. “If you want the shirt to recede into the background, you have to quilt it down.” Then the hat. The Quilting Density Demon said, “Leave it unquilted; allow it to share the focal point limelight.” Then the hat looked too puffy and unfinished. You can guess the rest. And then there were the hands. Oh, man, did they give me heartburn! First, I quilted around the hands and added lines to delineate the fingers and nails. I didn’t want to quilt them because I was afraid I’d wind up adding bizarre texture. And so I added only knuckles and creases to the right hand, the one in front. It looked like a glove. Then, I experimented by meandering on the left hand, the one behind the wheel. First, I used monofilament. Yuck. The thread was shiny and the needle left really visible holes. After ripping all of that out, I tried a bigger, less detailed meander with thread that matched the hand fabric. Still yucky. It made the hand look like it had a skin disorder. After ripping out the quilting AGAIN, I added knuckles and creases and steamed out the remaining holes. I don’t love the hands. In fact, I’m going to try to avoid looking at them. Oh, and I had to add the vintage fabric. I kept the basic hexogonal shape of the original grandma’s flower garden, but I cut them down into irregular sizes, used only green, and fused the pieces down into a tire track. They were still pretty green, and so I stamped them with both original rubber stamps and some commercial leaf stamps using black ink. I did a freeform zigzag around each piece and then pronounced it finished. The final challenge is the naming of the quilt. I want to incorporate Mary’s name into the title, but I’m not sure how. Puns are fine (Mary-ly we roll along), but I’d like to keep it simple. Since I need to print a label today, I guess I’m on my own to be creative. Thanks for reading along with this process description. In the next blog entry, I’m going to tackle a new subject: What Quilters Want. Hmm.